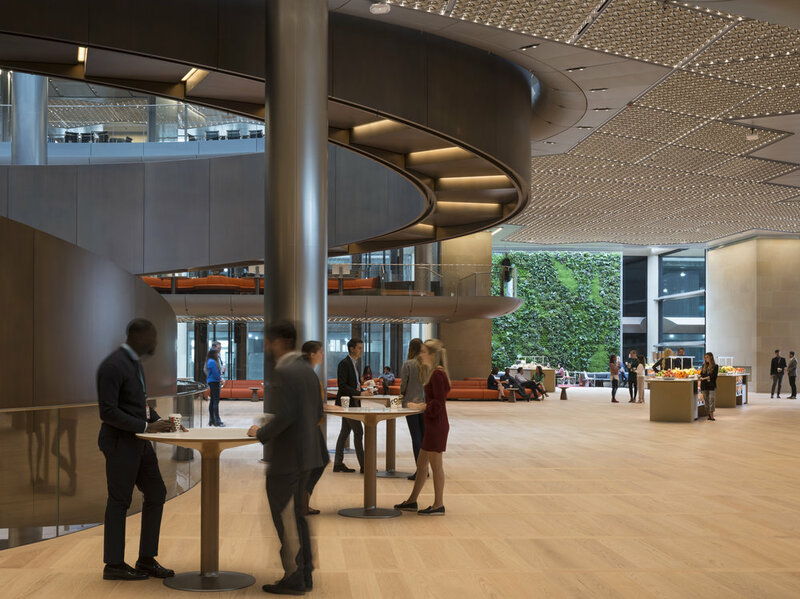 A new European headquarters for the global business and financial information leader, Bloomberg, opened in October 2017. Located between the Bank of England and St. Paul’s Cathedral, the new site occupies 1.1 million sq feet and houses Bloomberg’s 4,000 London-based employees. Both Air Diffusion and Actionair worked on this project, providing solutions for the building’s ventilation and fire safety needs. Actionair have supplied, and continue to supply, a variety of dampers and control panels. This includes hundreds of HotShield and FireShield damper units, provided to form part of the building’s fire safety system. HotShield smoke dampers have been provided to manage smoke and fire through the building in the event of a fire and are designed for use in dual ventilation and smoke control ducted systems. They are operational up to 300°C for 2 hours. The dampers have been supplied with 3 position control actuators which allow a damper to be moved to both the reset and release position, with the additional facility to move the damper to a third control position. The actuators are surrounded by our innovative, patented thermal enclosure. This has been specially developed and is made from a lightweight, high performing and technically advanced material that actually has the ability to absorb heat energy when subjected to a high temperature environment. This protects the actuator at high temperatures. Along with the HotShield, more than 150 uniquely designed Control and Monitoring Stations have been supplied to regulate and track the running of the HotShield actuators. The CMS is designed with the user in mind, giving them the opportunity to set a control position using an integral potentiometer or use an externally supplied control voltage. This advanced tool simplifies the running of dampers by providing visual and volt free indication of the damper position (its point, reset and release status). A terminal is provided to allow feedback of the 2-10v DC monitoring voltage. In addition, a fire alarm input can be made which will cause the damper to release if the contact is broken. A second input is available to cause the damper to reset to allow full air flow, for smoke ventilation as an example. The fire alarm release input takes precedence. The FireShield range of CE Marked ‘E’ rated fire dampers are used to prevent the spread of fire. These quality engineered dampers are suitable for air conditioning and ventilation systems requiring up to 4 hours of fire protection. The dampers are supplied with an innovative reset and removable release mechanism cassette. Most curtain fire dampers have a complex pull and lift curtain opening operation that is further complicated by the struggle in having to hold the curtain in the fully open position when resetting or replacing the fusible link unsighted and against a constant tension of closure springs. Actionair have created a reset cassette to resolve these problems. An external indicator is factory fitted to the cassette side of the damper casing to provide a visual indication of damper blade position. A spring steel actuator ensures automatic resetting of the external indicator in either horizontal or vertical applications. The external indicator is especially beneficial at the system balancing and commissioning stage; it eliminates the necessity of internal duct inspection to determine the fire damper’s open or closed position. A number of Actionair’s volume control dampers have also been supplied. The AirShield range of dampers are suitable for systems with a temperature range from -20°C to 70°C, making them incredibly versatile for a variety of conditions and were chosen for Bloomberg due to their excellent air control, shut-off and system balancing capabilities. Actionair worked with consultants to design a bespoke fire safety system for the redevelopment of a prestigious grade II listed building in the City of London. SmokeShield and HotShield dampers have been installed to prevent the spread of fire and smoke in an emergency, which are being controlled by the ActionPac LNS4 Control Panel System.